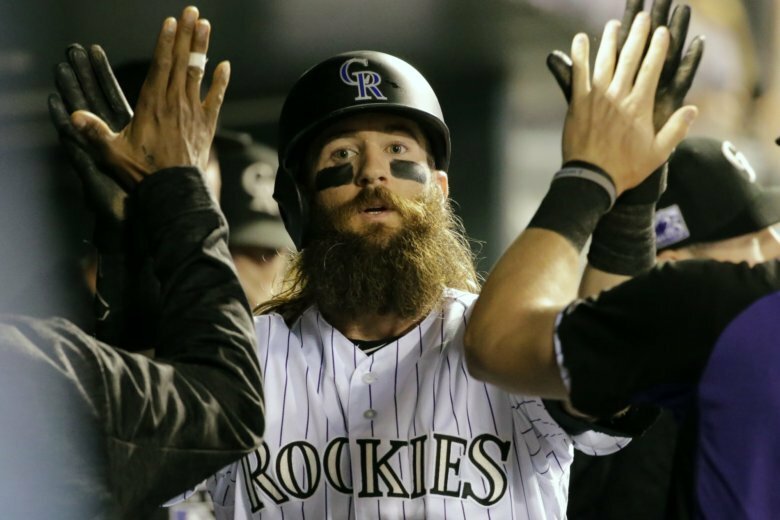 Despite never having won their own division, the Colorado Rockies have left their mark on October baseball. One fan shares the crazy game that hooked him on Rockies baseball for life. Like a lot of baseball fans who grew up in Colorado in the late ‘80s and early ‘90s, the Rockies were not my first pro baseball team. As the local 1993 expansion team, they were an excuse to finally see live baseball. I’m a D.C. resident now, and while I currently have five MLB teams within a four-hour drive of me, the closest MLB city to Denver before the Rockies was an eight-hour drive to Kansas City. So when the Rockies arrived, it was easy to root for the home team. I grew up in Colorado Springs and frequented the Rockies’ Triple-A team, the Sky Sox, where I saw future Hall of Famers Todd Helton and Larry Walker, among others. While the Rockies of the first 10 years or so didn’t bring playoff victories or even good pitching to Denver, the Blake Street Bombers kept it exciting. The high altitude and the consistent heavy home run hitting of Helton, Walker, Andres Gallaraga, Dante Bichette and Vinny Castilla, kept me constantly tuned in. My dad took me to several games at Coors Field throughout the ‘90s and early ‘00s, including the Rockies’ first interleague series against the Angels and games against future Hall of Famers Barry Bonds, Vladimir Guerrero, and Mike Piazza. My fondest memory, however, and the moment that sealed my love for the Rockies was one Aug. 22 night in 2000 against the always great Braves. It included a position player not only pitching, but getting the win (the first time that happened since 1968), a benches-clearing brawl, a Hall of Fame pitcher pinch-hitting, and a walk-off win, on a rookie’s first Major League hit. It went down as follows: After being hit by a pitch in the top of the 11th of a 6-6 game, Andres Gallarraga (a former Rockie then with the Braves) charged the mound, starting a bench-clearing brawl. The Rockies’ final reliever, John Wasdin, was tossed as a result of the brawl. Brian Bohannon — who started and threw 99 pitches the day before — came in to finish the inning (he was only good for a couple batters). After both teams failed to score in the 11th, the Rockies, now officially out of pitchers, were forced to enlist a position player to finish the game. Enter injured catcher Brett Mayne. He had never thrown a pitch at any level. Who does he face? None other than Hall of Famer, Tom Glavine who had not thrown a pitch but entered the game as a pinch-hitter. After retiring Glavine, Mayne gave up a hit, got another out and then retired another hall of famer Chipper Jones for the final out in the top of the 12th. In the bottom of the 12th, the Rockies loaded the bases and it was Brett Mayne’s turn to bat, but his left wrist was injured. So entered rookie pinch-hitter, Adam Melhuse whose first Major League hit ended the game at 11:30 p.m. The infamous John Rocker took the loss. The grit and determination the Rockies demonstrated that day characterizes the Rockies that I’ve watched and cheered for since. In 2007, ironically, I left Colorado and moved to New York. The year the Rockies and Clint Hurdle won the hearts of all baseball fans by winning 14 of their last 15 regular season games (and 21 of the last 22, including the postseason) to miraculously tie with the San Diego Padres for the Wild Card. In their first one-game playoff game, the Rockies won it after Matt Holliday, who eventually scored a dramatic, game-winning run in the 13th inning, hit a triple off Trevor Hoffman, causing the second greatest closer of all time to blow a save in the biggest game of his life. The Rockies swept their way to the World Series in the most momentous Colorado Rockies postseason to date. Fast forward to 2018: Matt Holliday is back (albeit in a much reduced roll), the Blake Street Bombers have been reborn with Charlie Blackmon, Trevor Story and Nolan Arenado hitting home runs at paces we haven’t seen since the mid-90s, and we even have decent pitching now. With their loss to the Dodgers Monday, the Rockies still have never won the NL West. But that hasn’t kept them from making the World Series in the past. Whatever they do, I’ll be watching along the way, and expecting some wild and dramatic extra-inning finishes.